﻿ Abidexin Review: Is it Safe? Abidexin is a weight loss supplement that comes in pill form and allegedly boosts metabolism while reducing body fat, too. Additionally the product is supposed to give consumers better control over their appetite. But does it really work? It is clear there are many products available on the market, and our team of nutrition research enthusiasts are always on the hunt for the latest, most talked about products. Let's give Abidexin a look! Abidexin is brought to you by NutriPharm, LLC, the same company behind several other products such as Slimrexin, Fexotropin, and others. According to the Better Business Bureau this company has received an F rating - a major red flag for anyone looking for a quality product. Still, let's see what is inside Abidexin. 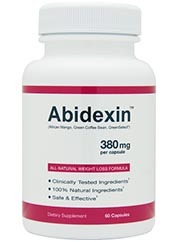 Abidexin contains 5 key ingredients that are supposed to work symbiotically toward building up energy, reducing appetite, and increasing fat burn. However, disappointingly one of their key ingredients appears to be caffeine. This is hardly impressive and only goes to show that 20 percent of Abidexin's key ingredients are what you would find in a standard cup of coffee. Additionally, the product contains a 200 milligram dosage of green bean coffee extract. Although this ingredient has been proven to be effective in reducing overall appetite and fighting unexpected food cravings, again we were disappointed to find that many supplements also offering green bean coffee extracts offer them at much higher dosages (around 600 milligrams). Although we are not saying this dose is ineffective, we are saying that many competing products will offer a higher dosage of the extract. Very expensive and contains either unproven ingredients or proven ingredients at weak doses. Originates from a company with an F rating on the BBB (Better Business Bureau). The remaining ingredients are Irvingia Gabonensis (a largely unproven product with only a handful of studies to its name), as well as "green select phytosome green tea" and "coenzyme Q10" - two ingredients employed at a similarly tiny amount of 150 and 50 milligrams, respectively. However, despite the product's low amounts of quality ingredients, one area where the product does offer a high number is on the price! A regular bottle of Abidexin - containing 30 capsules - is sold on the official website for 50 dollars. For this money you can find something better. Moreover, there is a good chance you will need to refill sooner than expected seeing as the recommended dosage is between one and three capsules daily, meaning if you take the full dosage you are only set for ten days! All in all, buyer beware: not only does this product fail to come from a legitimate company, but it is also shockingly expensive. Although Abidexin does come in very professional-looking packaging - taking on the appearance of prescription bottle when in fact it is not - it is impossible to ignore the fact that the business where Abidexin originates, NutriPharm LLC, has an F rating on the BBB. Additionally, out of 65 independant reviews on Amazon, the average rating was 2 out of 5 stars. That said, the product does contain acceptable ingredients, but the fact remains that every one of them is either utilized at an ineffective proportion, or still largely unproven in general. In our team's recommendation, consumers should only buy supplements from reputable companies with long lines of reputable products. Bottom Line: Conclusive clinical studies, effective proportions of ingredients, and a fair price tag are the three main areas where Abidexin fails, and therefore this product also fails to earn our approval.